Kenny, Kyle, Cartman, and Stan will be on Comedy Central through 2019. The boys from "South Park" will have a home on Comedy Central through 2019. 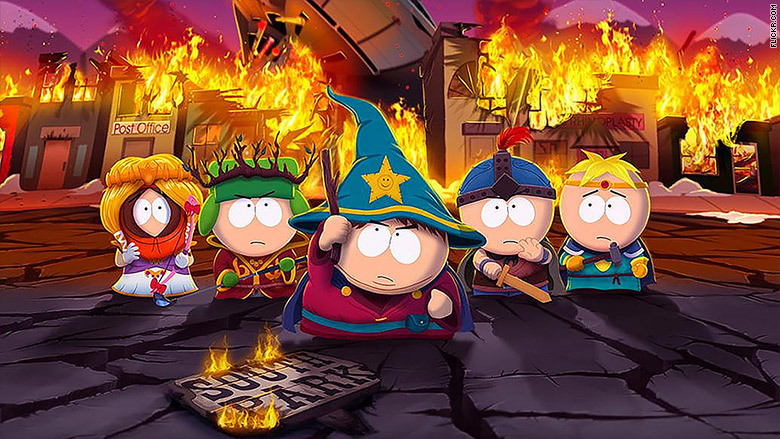 The Viacom (VIA) network announced on Wednesday that its popular animated series starring Stan, Kyle, Kenny, and Cartman has been renewed for three more seasons. This would take the long-running series to 23 seasons and remarkable 304 episodes. It first premiered on Comedy Central in 1997. "'South Park' remains the bedrock of Comedy Central and we are thrilled that new episodes will continue to entertain audiences for years to come," said Michele Ganeless, president of Comedy Central. "The series remains as urgent and relevant now as the day it premiered and at nearly 20 seasons in it continues to draw generations of new fans." One of the ways the series draws those new fans is away from TV and on digital streaming service Hulu. The series, which kicks off its latest season on September 16, made an exclusive deal with the streaming service last year to host all previous episodes of the series. Wednesday's announcement also said that Hulu would have rights to stream the news episodes as well. For Comedy Central, the deal allows the network to keep one of its trademark brands while another, Jon Stewart, comes to an end. Stewart is stepping down from his long-time position as host of Comedy Central's "The Daily Show" on August 6. "South Park" remains the top-rated comedy series on cable in 2014 among adults aged 18 to 49, according to the network. It also has a strong following on Facebook with over 46 million fans. While popular the series has also been one of the country's best satirical series taking on wide-ranging and controversial topics such as racism, censorship, and religion.